Regardless, I gave it a try. 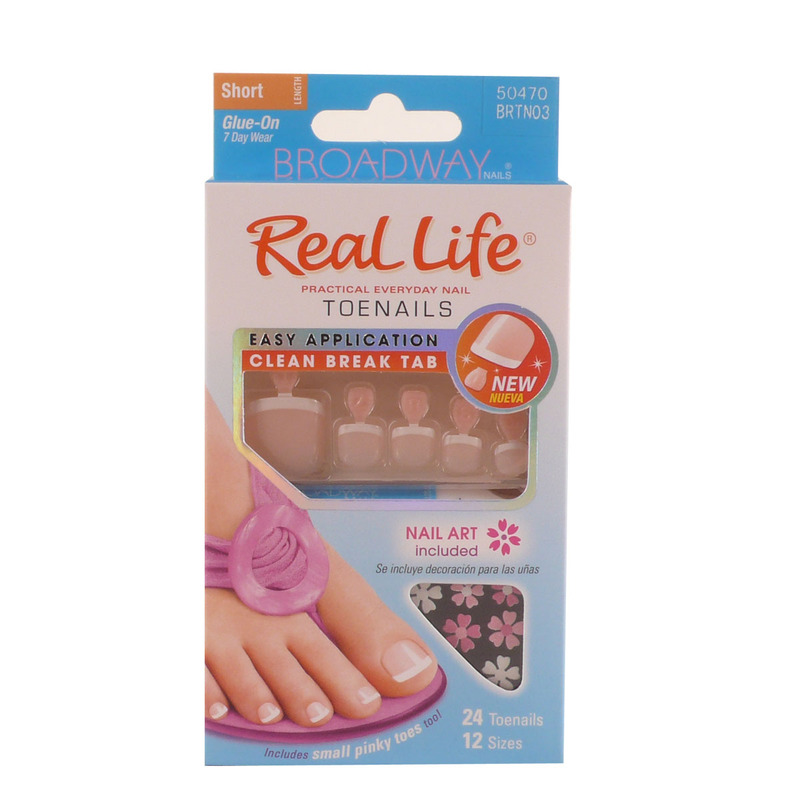 I spotted the box at my local drugstore and was immediately intrigued by the picture of the foot on the box; the nails were so perfect. We are not talking long extension nails here... just very nice, normal looking french pedicure toes. In a box! Some people are not a fan of the french tip for toes but I ALWAYS have mine painted in the french style. Every now and then I spring for a fun color, like hot pink, but I always tire of it and want it french tipped again (just my toes, my nails always have fun colors). I brought the box home, excited but a bit wary, and proceeded to give them a try. I was a little predisposed to dislike them, just because it is SUCH a weird concept, but I was determined to give them a fair shot. I stuck them on, taking my time to ensure the right fit for each toe, but there wasn't one for my pinky toe. They were all too long and looked like I had a freak toe (not the look I was trying to achieve, btw). My box came with complete with little flower decals, so I went all out and decorated my toenails and then went to show them off to my friends. Let's just say they are a FREAK. CONCEPT. I felt totally bizarre the whole day, and they kept getting caught in my socks that night. I didn't notice it during the day because I wore flip flops so I could rock my tacky looking toes but I think they would feel uncomfortable in shoes. I took them off the next day, thinking they were just one step too unusual for me. Overall opinion: nice to try, but probably will never touch them again. You might like them for a one off occasion, like prom, but don't be too concerned if you do not have the right fit for your pinky toe. You do not have a deformed toe. Broadway just doesn't make them little enough! Also, please forgive me for not attaching a picture of my toes - I find that a bit too much. I don't really like feet, lol. Yes, that's right! I am down to my final two on project 10 lush, and let me tell you - I am quite pleased. I already have my wish list going of what I am going to try next, cough Jasmine Henna Fluff cough. They also have these amazing looking Sugar Lip Scrubs that are new on their site that I'm sure smell SCRUMPTIOUS! 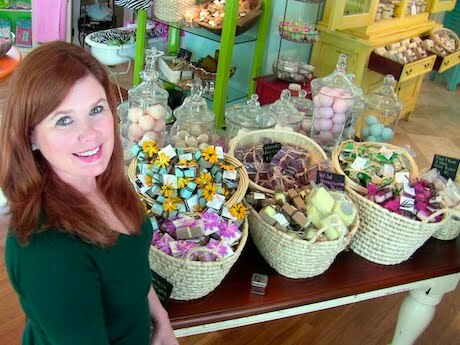 I personally want to try the sweet lips scent (milk chocolate yumminess!). The highlighted ones are the ones that have mini reviews, so you can read about the individual products - I did not love all of them! Blackberry Bath Bomb - I LOVED THIS ONE! Read the review! Do it! Do it! So the one I finished up tonight is the Comforter Bubble Bar . I have purchased this one over and over - it is truly one of my favorites. Lush claims it is big enough for 2 baths - I use it for 4-5 baths easily. 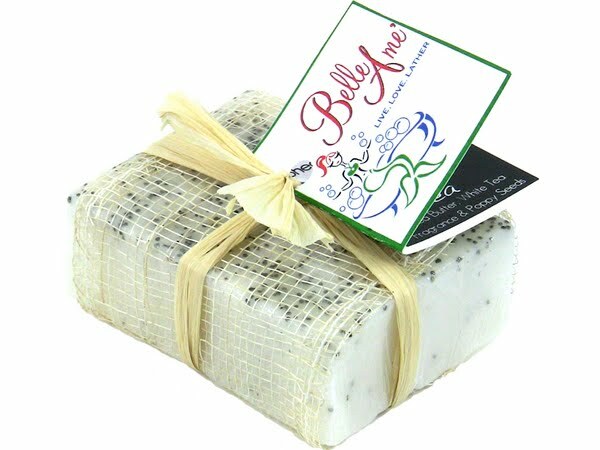 It makes luscious bubbles and smells amazing, so soft and comforting. I will be repurchasing this one, I like to always have a piece for when I am in the right mood. For those 21 and over - a glass of wine and this bubble bar makes for a very happy girl. That means one left! Then I get to do a lush haul! Project 10 pan update - I have mostly finished up a few more items, but honestly I am not being as diligent as I am for project 10 lush. I haven't bought any new products, but I have been sent stuff so it seems like I am cheating. I have been trying out new stuff and not concentrating on using up the old, but I am still trudging along! I recently went through ALL my mascaras and threw all but a few away, all ones that are under 2 months old (anything older than 3 months should be tossed anyway - eye infection alert!). I might be doing a blog sale soon to clear some more stuff out just because my collection is way too big for one person. I will be posting videos more frequently (I hope!) starting this week, I have a bit of a traveling break so I want to film, film, film. Look for one Wednesday. I have had a bit of a cold for the past 2 days, and while slathering on my Carmex I came to a realization. I was using a VERY bland balm. Not very Elle-like at all. Regardless of its blandness, I actually really like it, so it inspired me to write a new in's and out's (imagine, inspired by a bland balm). Benefit Stay don't Stray Primer. Yet another eye primer to enter my collection along with its buddies Too Faced Shadow Insurance and Urban Decay Primer Potion. I have ALWAYS held tight to the fact that I much prefer MAC paint pots to either of the two latter primers, but I really do like stay don't stray. It is a bit thicker then the other two, so it conceals my eyelids well, priming them perfectly for shadow. I find with the others (especially with Too Faced Shadow Insurance), that they are so thin and liquidy that I don't feel like I have a strong enough base on, which is why I always reach for my paint pots. Be forewarned though - it pumps out way too much, you have to pump just the tiniest amount on to your fingers. If you did an entire pump it would be enough for your entire face! I really like this mascara! It goes on very black and doesn't clump up, and it pretty easy to use. The brush head is really big though, bigger than my eye so that takes some getting use to, but I do really like this one. Bright Colors. I'm talking about everything; makeup, nail polish, clothing, room decor... etc. Spring time always makes me appreciate colors more, and I love that it is warming up. Glee! Ahhh I adore this show! It is SUCH a feel good, pick-me-up, perky show. I always end an episode feeling happy and satisfied, unlike Lost where I just feel confused and completely unsatisfied. Easy, chill out reads. I adore intense books and novels that make you think as much as the next person, but sometimes I just want an easy "beach" read (that's what I call them). I recently bought two when I was in NY purusing around a mall wasting time (I also bought a chocolate covered strawberry), and I am really enjoying them. The first is called "Twenties Girl" by Sophie Kinsella, who wrote the Confessions of a Shopoholic series, (which I highly recommend). 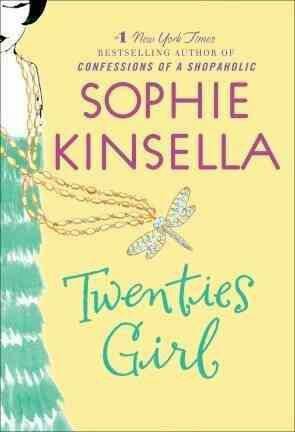 It's basically about a girl who is followed around by an annoying ghost, who is her great aunt who lived to be 105 and then croaked, and now is a 23 year old flapper who likes to gamble and yell at the live beings of the world. I'm also in the middle of reading "Need", which I also really liked but I misplaced it which is why I started on another book. It will show up someplace random like in the pantry and then I will continue on my merry way with that one. I don't mind reading more than one book at a time, but sometimes it gets wearing because you feel like you aren't getting anywhere. The 3rd book I bought, if anyone is curious, is "Love the one you're with" by Emily Giffen, who wrote "baby proof" and "something borrowed", both of which I enjoyed. Blandness. 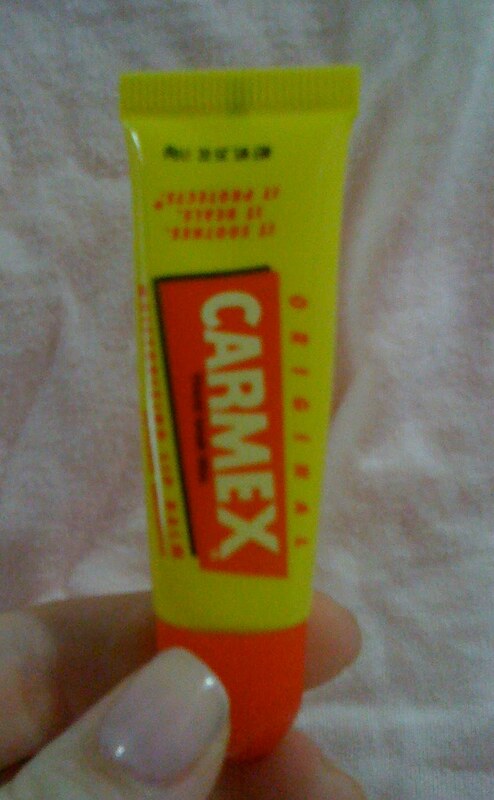 Like my Carmex. There is no need for blandness in life. Sweets. This is not because of a diet or anything of the sort, I have just not been craving sweets or desserts for the past week or so. Weird? Yes, but I'm not pushing it. I will wake up one night with an intense craving for ice cream, and then there will be no holding back! Traveling so much. I LOVE traveling, but I haven't been in the same state for over a week in a couple months it feels like. No one likes being that unsteady in life, lol. I just want to chill out and lay by the pool and enjoy summer! Not that that is even an option, as dad has not sprayed the wasp nest yet so there is a whole lot of buzzing going on down there. Grey's Anatomy. I don't know why but I have watched this show from the start, and it is not very interesting anymore. I don't look forward to it nearly as much as I used to, and lately I have been skipping episodes all together. I guess I don't have much to complain about, I am pretty happy right now. I always have more In's then Out's so I guess that in itself is an In. I am sitting at an airport (alone might I add - I hate traveling alone) so I am going to amuse myself by having a quick ramble. In about 3 hours I will be landing in NYC and heading to my hotel, where I will proceed to nap for a couple hours and then spend the day exploring the city. As you guys might remember, I lived in Manhattan last summer so I'm familiar enough with it to feel comfortable trampoozling around alone (even if it's only 4 square blocks from my hotel). Speaking of traveling, I have an absolute problem with overpacking, so today I compensated by packing practically nothing, which means I will have to make a quick stop at a drugstore to buy completely necessary things that I thought I could leave behind. You would think I would know myself better than that. I'm getting quite tired of Project 10 Lush; I finished up two more products, bringing the total to 8, but there are still 2 to go. I completed my therapy massage bar and my honey I washed the kids soap. Both of these products I have purchased on several occasions, so there isn't anything new to tell you about them, but I still very much enjoyed them. 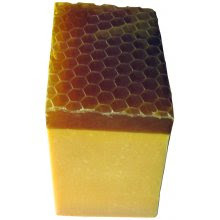 I especially like honey I washed the kids soap, it's one of my all time favorite products (I love the lil honeycomb on the top!). This morning I went running about trying to say goodbye to my cats but I couldn't find Bella. Bear was running around under my feet, trying to sneak into my suitcase or my car but Bella was hiding. I finally found her in a flowerpot in the front yard, sitting in the dirt. Weirdo cat. You are not a flower. She looked very serene and happy, like that was her happy spot. To each their own, unusual creature. Ahhh I need a new book. I finished all the house of night books that are out, so I have a new book with me for the flight - I hope it is good! It's called "Need". We are boarding now, maybe I will post again tonight since I will be bored in the hotel! For the past few months one of my roommates has been swearing by Moroccan Oil, claiming it makes her hair feel and look amazing. I finally gave in and tried hers one night, but I didn't notice anything exceptional, so I ignored her statements and went about living my life. If you are curious, I have been using the Redken Satin Wear as a heat protectant, and then my Framsi Wio Straight Balm to help tame my annoyingly textured hair. Sometimes I use another product or two, but those were my only must have products until about 2 weeks ago. I now have a new hair love. I was sent a few products to try from Eden Allure, a Moroccan Argan Oil company. I tried the Organic Moroccan Argan Oil out one night, not expecting big things (after using my roommates and feeling so-so about it), but I gotta say - this one is really nice! I have been using it every shower now for 2 weeks and I can tell a difference in the manageability of my hair. I place a few pumps onto my fingers and rub it throughout the ends of my hair, repeating if I need to. You do not have to use a lot of this at all, in fact I would be a bit nervous to use too much, since it is an oil. Moroccan Oil is rich in many vitamins and is very good for your skin, nails, and hair. I have also tried this out on my nails, and it is a great cuticle softener. 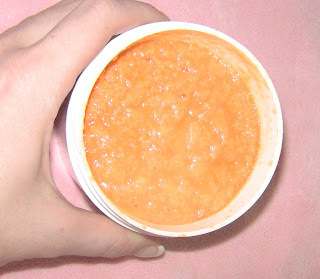 I was a bit timid to try this out on my face, even though by researching it online it has great benefits for your skin. I finally decided that since I have dry skin it might be good to try it out, so I used a couple pumps on my face. It is said to be really good for your fine lines and crows feet, as well as giving you a healthy glow. My skin literally drank this stuff up! I know there are lots of Moroccan Oil brands out there, but I especially like the company outlook of this one. They purchase their oil from the Berber women of Morocco, helping to promote the advancement of the long oppressed group of women. They also donate a percentage of their proceeds to the Global Fund for Women - talk about empowering women! This charity helps provide relief to abused and impoverished women around the world. I was also sent two bars of soap to try out, a grapefruit and a lavender, that are infused with Moroccan oil. My favorite is the grapefruit - it smells fruity and has little chunks in it that look like pieces of fruit. 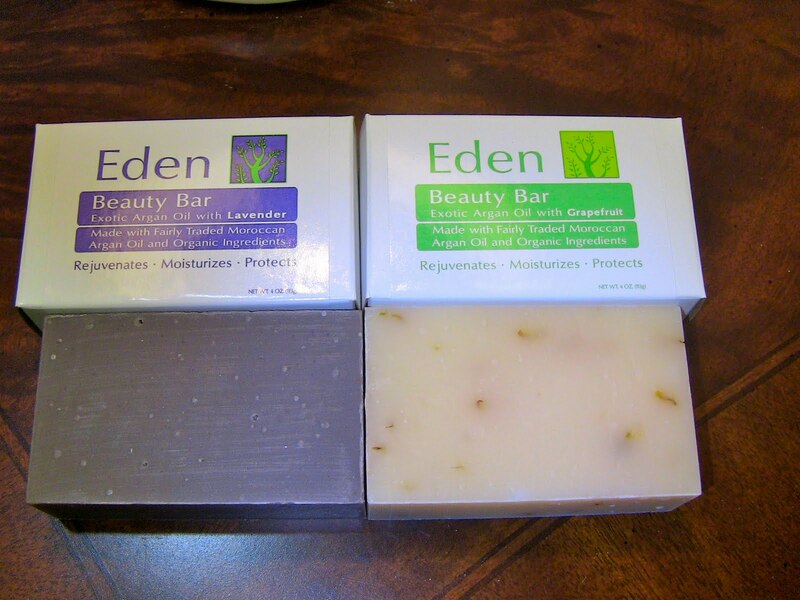 These bars are extremely moisturizing; they are not stingy with the oil, and you can definitely feel the softness. They lather up really well and have a very soft scent. If you like soaps that are not heavily perfumed these would be perfect, but if you do like the heavy scents you might not be quite satisfied with these. Bottom line: For me, the oil is a must have. It is nice on my face and nails, but I think I will save it for my hair since I see such an improvement with it there. Moroccan oil users - are they any other techniques or uses I should try? I'm sitting with my entire family watching New Moon, which my dad stubbornly calls Blue Moon, and as I'm an expert multitasker I feel a bit fidgety watching a movie without doing something productive at the same time (unless I am at the theater, and even then I like to text on my phone). So I'm sitting here clack clack clacking away at my keyboard while Edward tells Bella how "she's not good for him" and "he has no soul" and looking incredibly like a big ball of torture and pain. Thank goodness for the level headed werewolves who find her; Edward just leaves her in the woods to rot. Yesterday I was driving around and I noticed some cows on a hill. This is not a strange occurrence, since there is farmland around my town, but the strange part was that the cows were standing on a very steep mountain side, and looked like they were going to fall right out into the sky. You know that saying about how some cows have 2 legs shorter to help them stand on hills? 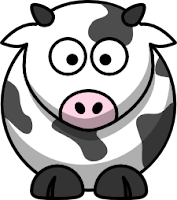 (or not, I'm not sure it's a well known saying) It got me thinking... that sure would make life easier for them, until they got shipped off to a flatland farm in Kansas and became the weirdo lopsided cow. Speaking of cows, my littlest sister recently visited a farm with a friend and came back talking about how she likes the "'mell" of barns and that she thinks cow food 'mells good. I'll take her word for it. Today the weather was beautiful, sunny and warm, so I decided to take advantage of it and go outside to read by the pool. This sounded like a good idea in my head :) Bear followed me outside and basically sat there in the shade to watch me struggle with moving a pool chair from the storage room to the pool area. After rotating the chair to the perfect sun-is-not-in-my-eyes-but-I-will-still-get-an-even-tan angle I plopped down only to find that Bear had already claimed 80% of the chair. So I made myself content with my 20% and started to read until I heard a suspicious buzzing. Uh, yeah. There was a wasp nest not 3 feet away from my little oasis. I'm not gonna lie, they kinda messed up the idyllic vibe I had going. I tried to ignore them but then I realized that Bear would most certainly not protect me if the wasps decided to show me who's boss, so I went inside. Ahhh, I love this movie. Jacob = love. Why aren't there more guys like him out there? I'm gonna finish this movie up and then have an early night. I hope everyone enjoys Easter Sunday (if you celebrate it!) and if not just have a relaxing weekend :) New videos soon! Recently I was sent a box of goodies in the mail by a bath and body company. Before I get started on my haul and review I want to mention that I get sent bath products often, since I am quite addicted to anything relaxing, and rarely do I find a company that I reach for over Lush. That being said, I have really been enjoying this selection of yummy smelling goodies, so I wanted to share my thoughts with you all. I did some research on the company, and I like that they do not test on animals, and that each item is hand packaged with love. Even the picture of the store is adorable - I want to visit it! The next item I tried was the Oatmeal, Milk & Honey Shower Gel. Could this one sound any more yummy?! Geez, I want to eat it! I absolutely love the packaging for this one, all wine bottle shaped and glamorous. It is $9.95 for a 12 oz. bottle. My thoughts? I love the smell, but I can't say 100% that it smells like the name implies. There is definitely a hint of oatmeal and sweetness, but I can't exactly pinpoint another scent in the shower gel. Regardless I really like the scent, and I like how the products foams up. Just like the Honey Almond Scrub it produces a nice, thick lather that Lush products simply do not do. Sometimes I feel like I am getting cleaner if my product foams up, even if it's just in my head. I was also sent one of their bath bombs, the Stop and Smell the Roses scent. This is a rose scented luxurious bath bomb that is supposed to remind you to stop and smell the roses every now and then. Speaking of, when Blair and I were in LA a few weeks back we were walking past a gorgeous flower garden and I stopped to smell one of the flowers, which Blair thought was VERY odd. She made an annoyed huff and I got startled and a honeysuckle went right up my nose. I think the idea is nice, but maybe I will keep my nose to myself when I am around Blair. I haven't used this bath bomb yet because I am saving it for when I really need to relax, but my initial thoughts are that it is pretty and smells exactly as it should. It is $4.95 for the little one, and looks like it has real rose petals infused into that bath bomb, which is always fun :) This one has Kaolin Clay in it to help draw out impurities with Vitamin E and Omega 3 fatty acids to help soothe your skin. I can't wait to use this one, I will let you guys how I like it. I also got 3 soaps. I like all 3 of them for different reasons, and it is hard to decide which is my favorite, but if I had to pick 1 it would be the "Island Spa" scent. This one is a combination of Honeysuckle, Clary Sage and Mango - again with the honey scents! This company obviously knows me well to pick all these honey smells :) I can most definitely smell the honey suckle in this one and a tad bit of mango (which is one of my favorite fruits), but I don't know what Clary Sage is supposed to smell like so I can't be of much help there (LOL!). 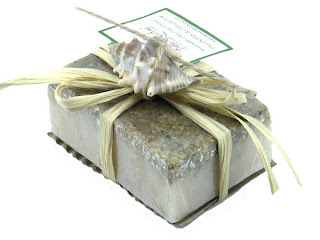 It has shea butter to moisturize and a layer of oatmeal to help soften the skin, and has a little seashell on the top of the soap, which I think is a nice little touch. 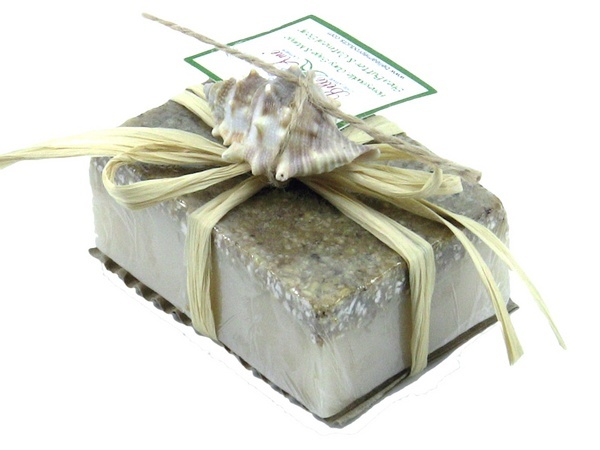 You can bathe with this soap and set the seashell on the side of your tub and think of the beach. This soap is really nice, and not like anything that can be duped at lush - I will be purchasing one once I run out. The other two I received are Citrus Crush and Fujian White Tea. Citrus Crush comes with a little Glycerin Orange slice tied to the top. I think I am a major sucker for these little details - the orange slice is reason enough for me to fall in love with this soap. This one is very fresh and clean feeling, and is the type of soap I would reach for in the mornings to invigorate me. I has grapefruit, lemon, and orange essential oils, and is a very pretty soap, if you know what I mean. I like the look of this one on the side of my tub. Fujian White Tea is a very light and sweet scent that smells as you would imagine it to - a little like white tea. It has little poppy seeds in it that help exfoliate your skin and the scent lingers on your skin after you use it. 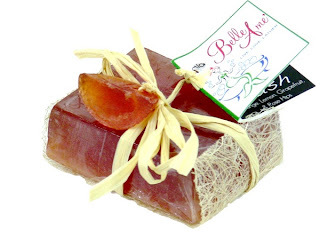 It is moisturizing and soothing, and the type of soap that you could use morning or night - on one hand it is rejuvenating, but it is also soothing. The soaps are $5.95 each and I used stock photos from the site since mine are cut up and used. My overall thoughts on this company is that I really liked everything I received, and I will be placing my own order soon. I love the Lavish scent, so I might try it in a few more products (like the bubble bath! ), and since I adore all 3 soaps I think I will try a few more of those. I might use the rose bath bomb tonight - I'll keep you posted on Twitter @ellefowler. xoxo everyone, let me know if you have tried anything or if you order anything from here!